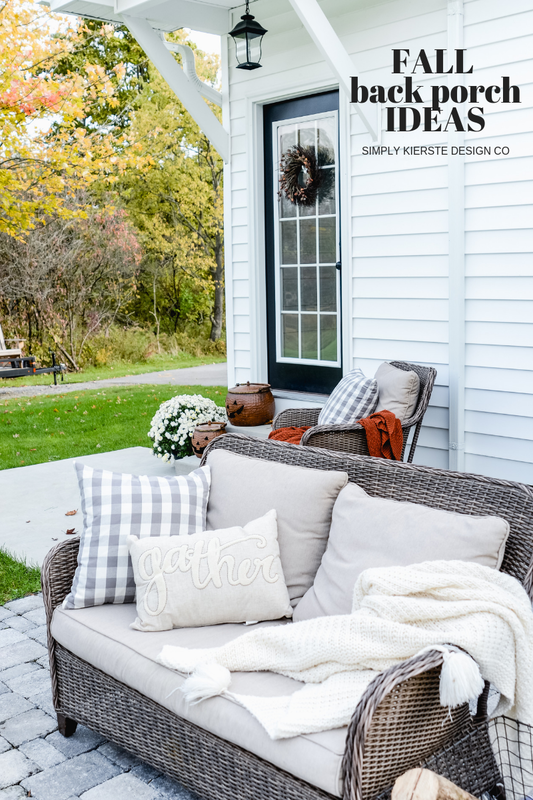 Easy Fall Back Porch Ideas | Simply Kierste Design Co.
Fall is one of my most favorite times to be outside, and to have family and friends over. That means I love to get my back porch decorated for fall! 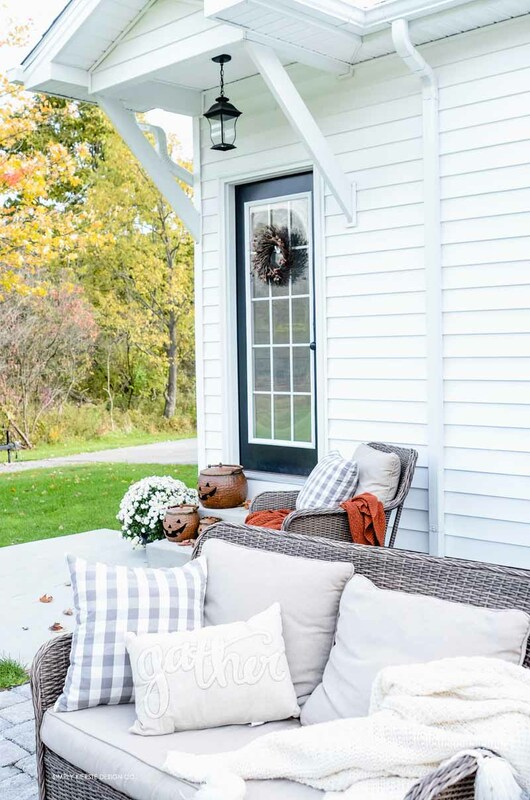 Today I’m sharing some easy fall back porch ideas — a few simple things you can do to add farmhouse fall style to your backyard. 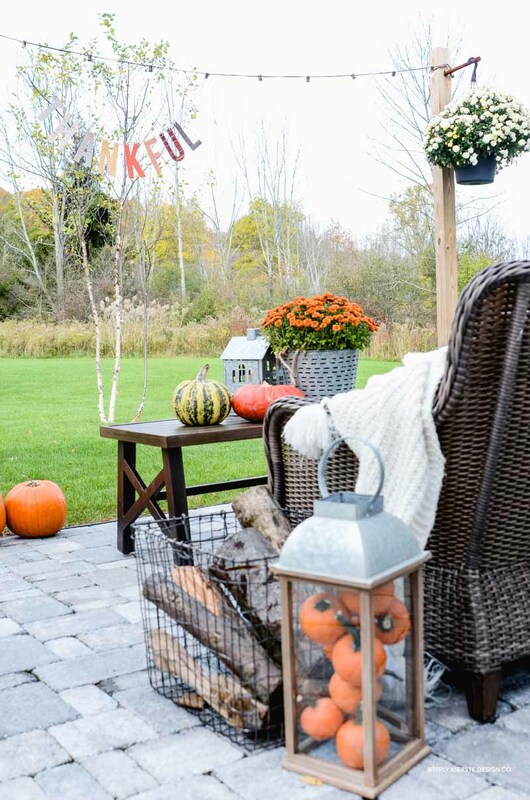 Fall is all about being cozy, and that’s my goal when I’m decorating any space for the season. Throw blankets, pillows, and candles are a great place to start, and they’re simple touches that will make a huge difference. A huge thanks to Better Homes & Gardens at Walmart for sponsoring this post. All opinions about their product are 100% mine. Affiliate links for included products are below. 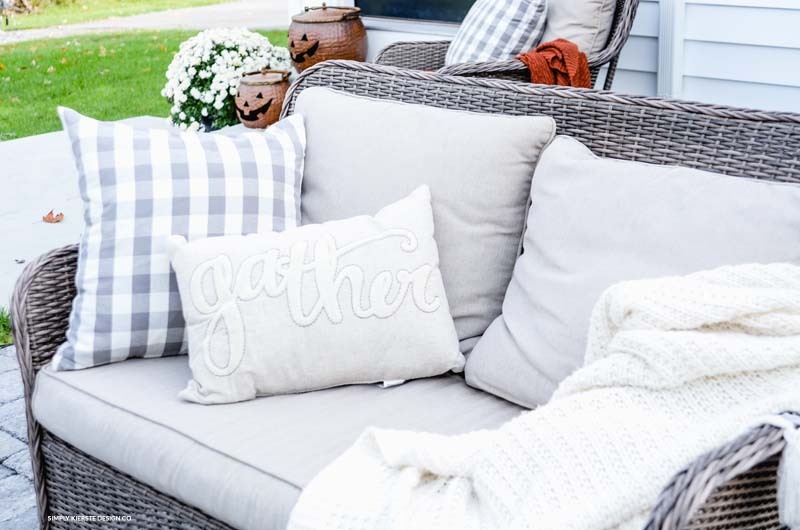 I fell in love with this Gather pillow–and it’s less than $12! It’s perfect for fall, but I can use it year round too. Throw blankets are kind of an obsession of mine, because they serve a dual purpose–style and comfort. How much do I love snuggling under a cute blanket? SO much! Especially on a fall evening with my family, or a crisp fall morning with a cup of hot cocoa. This darling cream pom-pom throw is exactly right. Lanterns are another way to add farmhouse style and fall charm at the same time. Do you not love this galvanized and wood lantern? 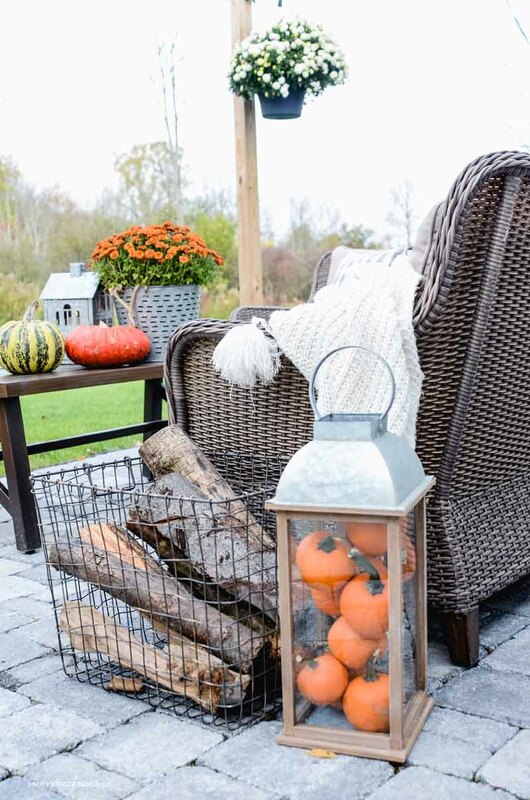 It’s a great size–nice and tall–which makes it easy to fill it with fall decor, like small pumpkins or pine cones. And at less than $25, it’s a steal! 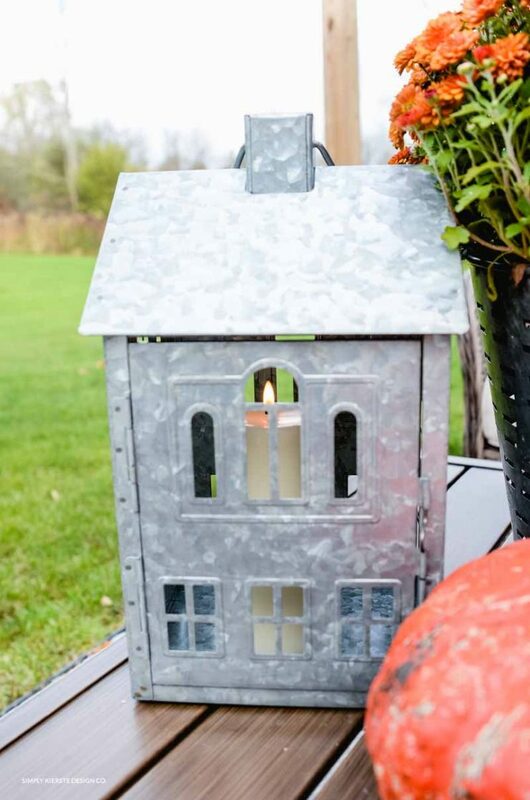 Candles just speak fall to me, and I fell in love with this adorable galvanized house candle holder. It’s perfect for the small patio table–it looks great both day and night! I always try to add flowers in some way to my outdoor decor, and mums are the epitome of fall. Did you know that you can get Better Homes & Gardens mums at your local Walmart? Just check out their garden center for a variety of sizes, colors, and price. 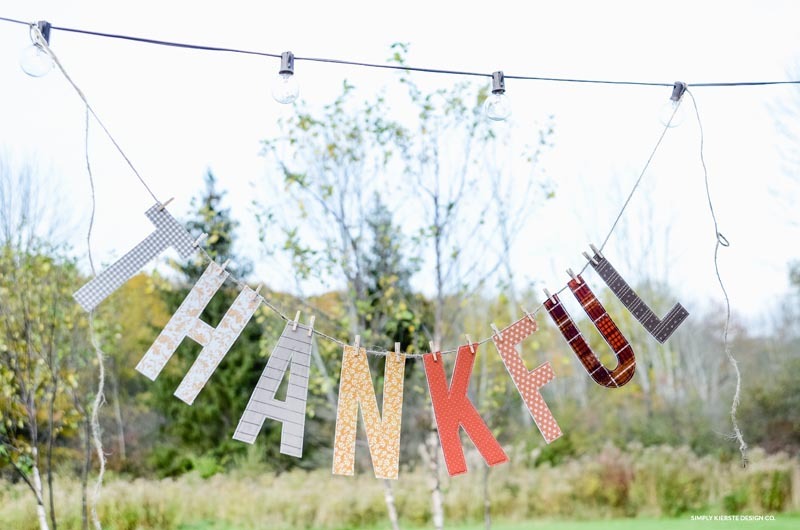 They’re perfect on my table, and hanging from the DIY posts we made, along with my favorite string lights. 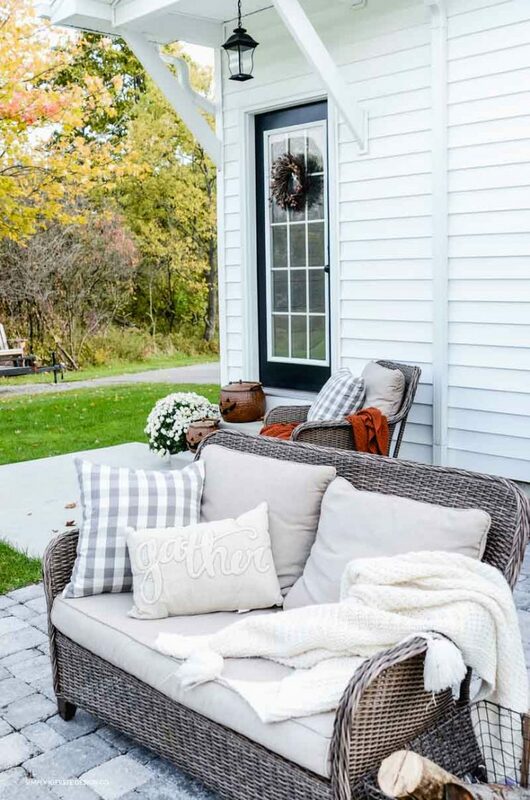 Fall coziness! String lights serve an additional purpose…you can hang cute things from them! 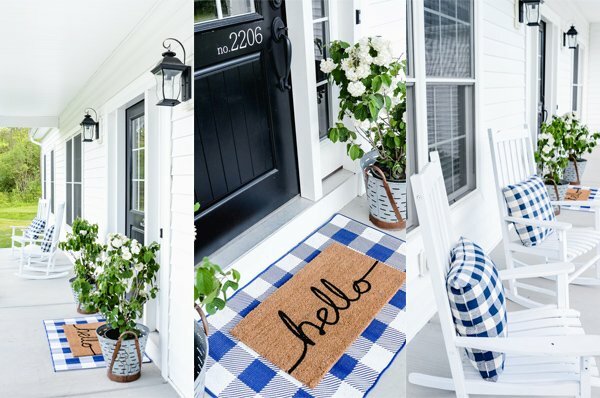 What I love about almost all of these things is that they work inside too, so if you’re looking for simple ways to add fall coziness and charm to your home, they’re a great place to start! Love the buffalo check pillows. Do you mind sharing where those came from? Thanks!!! Looks beautiful! !